In China, 2010 will be the year of the Tiger. In the tech world, 2010 will be the year of the Tablet – or so it seems. A bevy of tech companies have teased, talked, and have not denied rumors that they are working on a fabled tablet computer. Here is a look back at 2009 tablet buzz with a look forward to 2010 – the year of the Tablet. Asustek is rumored to be working on an Eee Pad, according to Digitimes. Rumors of a Dell tablet won’t go away. 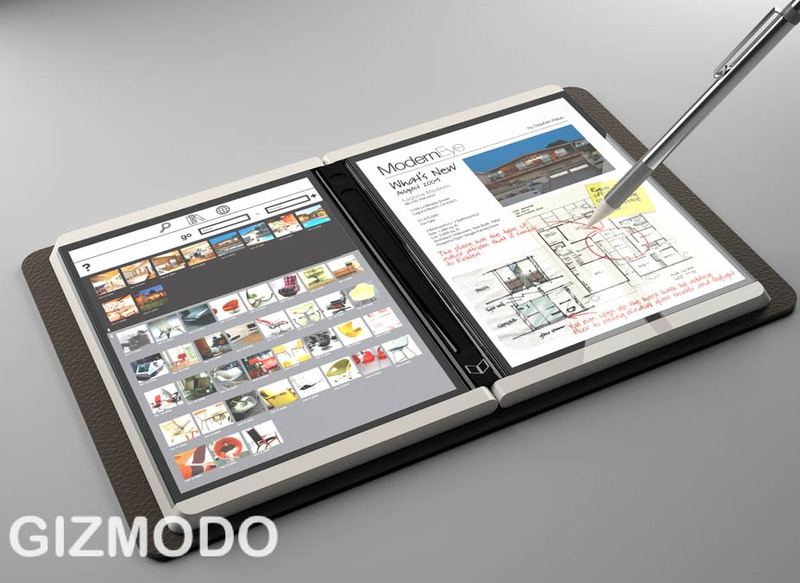 Earlier this year, rumors of a Microsoft two-panel tablet appeared after Gizmodo got its hands on one of Redmond’s concept videos. And starting Friday, the JooJoo Web tablet is supposed to go on sale for $499 at thejoojoo.com. And of course there is the ever-present Apple rumor that “soon” it will introduce a tablet. Let’s take a look at the hottest tablets that may, or may not, be hitting store shelves next year. Many of the tablets being discussed online are highly fictional at the moment, but the JooJoo is one tablet that’s already here. This device has a 12-inch touchscreen with 1366 x 768 resolution capable of displaying 720p high-definition videos. The processor is rumored to be a 1.6GHz Intel Atom chip, other specs include 1 GB RAM, 4GB solid-state drive for caching Web content, one USB 2.0 port, Webcam, microphone, headphone jack, and Bluetooth and Wi-Fi connectivity (no 3G). The device is supposed to go on sale online as of Friday, December 11 for $499. But at the time of this writing the Website was still not accepting pre-orders, and that functionality may not come online today. As you may know, the JooJoo is mired in controversy due to its previous incarnation as the CrunchPad, which was to be a joint venture between TechCrunch and Fusion Garage. Early Friday, TechCrunch Founder Michael Arrington confirmed that his company had filed a lawsuit against Fusion Garage. It’s not clear what effect this lawsuit might have, but Fusion Garage could be forced to suspend sales of the JooJoo, at least temporarily. In June, rumors of an iPod Touch-like device from Dell started surfacing, and now there are reports that Dell is set to reveal this ‘tablet’ at the Consumer Electronics Show in January. Details are scarce, but according to the latest rumors, the Dell device would run Google’s Android operating system and have a 5-inch touchscreen. Of course, it’s a bit of a stretch to call this device a tablet in the Apple sense, in fact, this device sounds more like a mobile Internet device (MID). MIDs are nothing new and have been around for some time. Samsung made a splash at this year’s CTIA trade show in Las Vegas when it introduced the Mondi: a 4.3-inch LCD touch display device, with 4GB of onboard memory running Windows Mobile, hardware QWERTY keyboard, and WiMax support. Dell’s device could also be a multi-media player designed to compete directly with the iPod Touch and Zune HD. The Dell device will supposedly be available first in the U.K. on an unspecified date, with a U.S. launch to follow. Check out this video below that purports to show off this Inspiro-tablet. Details about Asustek’s plans are even more scarce than information about Dell’s device. DigiTimes says the device will be called the Eee Pad, and will have a 4- to 7-inch touchscreen, and will include a combination of MID and regular PC functions. Again, another device that sounds like a prime competitor for the iPod Touch and Zune HD. DigiTimes says the Eee Pad suggests may have been inspired by Apple’s rumored device. Tablets have been on Asustek’s agenda for some time, and the company recently got into multi-touch with the release of the T91MT, a tablet notebook with an 8.9-inch screen. Asus has also been working on a dual-panel laptop/e-reader that was supposed to be released by the end of 2009. Unlike the other tablets that have a multimedia focus, the concept reportedly being considered by Microsoft is geared towards creating a digital recreation of a two-page paper day planner. Of course, that description doesn’t do the Courier concept complete justice, as the device would include sketching and design capabilities as well. Check out the video below to see the Courier concept in computer-animated action. I almost forgot, no tablet roundup would be complete without mentioning that rumored device from Cupertino, California. The supposed Apple Tablet would be a device with a 9- to 10-inch screen, and would basically be a larger iPod Touch priced as high as $1,000. Although there is no verifiable proof this tablet exists it has already been hailed as the possible savior of books, newspapers, magazines and a better-than-average movie experience. You have to hand it to Apple. Even when the company officially says nothing, while rumors of the device run rampant, the team at 1 Infinite Loop has managed to influence the future plans of rival computer manufacturers and other industries that have an eye towards the digital future. Now that’s influence.